British sailor Alex Thomson is once again at the front of the Vendée Globe fleet after successfully hunting down arch rival Armel Le Cléac'h in the Southern Ocean. Four days after French sailor Le Cléac'h moved into pole position in the solo non-stop round the world race, Thomson reclaimed control once more as the epic duel between the two skippers continued. The pair were this afternoon neck and neck as they rocketed east, less than a mile splitting them from the next waypoint and with just seven miles of lateral separation. 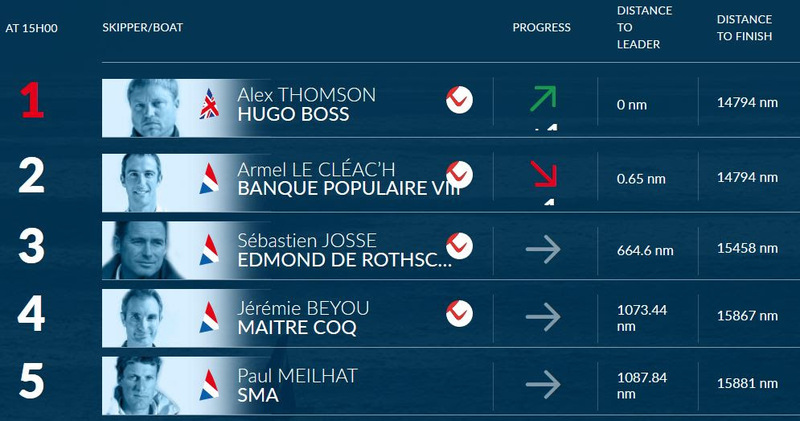 Hugo Boss skipper Thomson, the only British sailor in the race, had been reeling in Le Cléac'h's Banque Populaire VIII since the French skipper passed him on November 27. Le Cléac'h initially drew out a narrow lead of around 30 miles but was unable to fully capitalize because the weather conditions were not right for foiling. 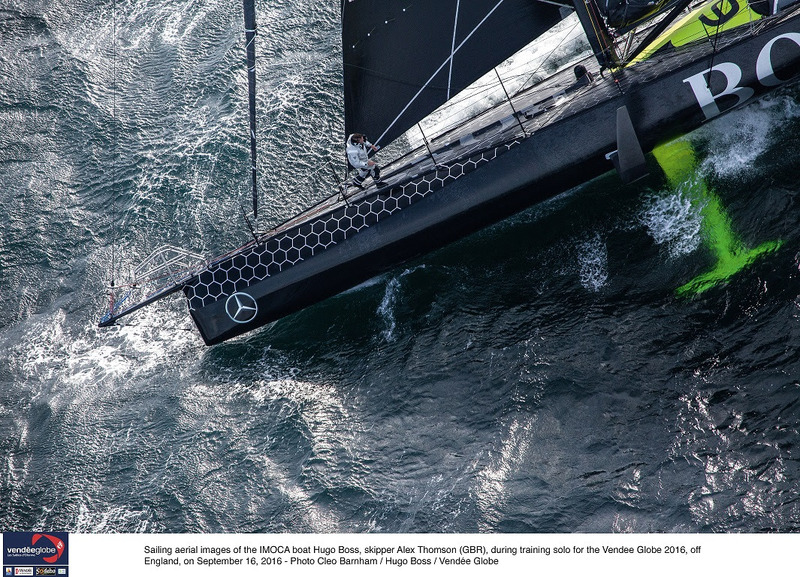 Despite boasting a broken starboard foil, lost in a collision with a floating object some 12 days ago, Hugo Boss has been the quicker of the two boats over the past few days. The record-breaking pace both boats have been exhibiting since the race start in Les Sables d'Olonne, France, on November 6, seems set to continue thanks to favorable weather conditions in the Southern Ocean. The story couldn't be more different for all but a few of the 16 skippers still in the South Atlantic. After enduring almost two weeks of painfully light winds, they were today being tested by breeze of up to 35 knots from a depression. 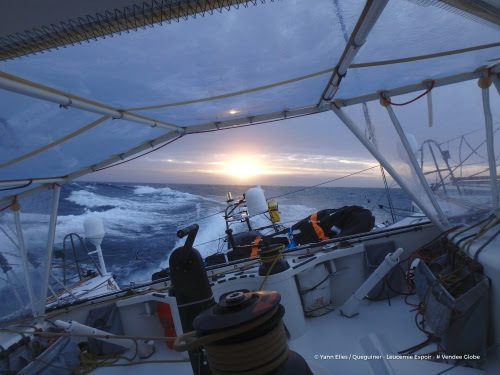 "We've gone from one extreme to the other in a short space of time," said an exasperated Stéphane Le Diraison, this afternoon in 17th place with winds of up to 30 knots and building. “Yesterday we were in the high. I'm now ahead of the front and things are starting to get rough. The wind is strengthening, the seas are building and the sky is clouding over. I'm finding it hard to sleep, because the boat is so fast and there is an incredible amount of noise. IMOCAs are boats that are noisy, shake you up and sound as if they are cracking." American Rich Wilson, around 130 miles to the north west in 20th place on Great American IV, was in a similar situation. 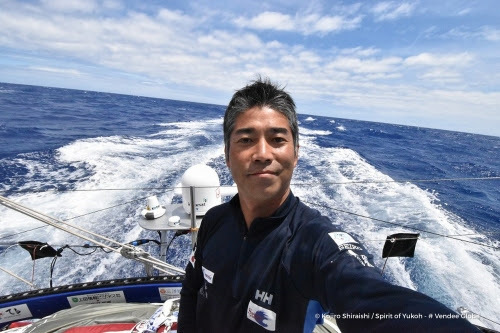 "It's noisy, the boat's vibrating all the time, and then there's a motion to it which is this sort of jittery, erratic movement like a freight train going down hill out of control," said Wilson, who at 66 is the oldest skipper in the fleet. "You've got to hold on all the time, and how you sustain that stress especially at night in the dark is just really hard. It's not comfortable physically or mentally - at least for me it isn't." Morgan Lagravière, who was forced to retire from the Vendée Globe on November 24 due to rudder to his yacht Safran, has left Cape Town bound for France. Vincent Riou, who also retired to Cape Town, is tipped to leave later this week after fixing the keel bearings on his yacht PRB. Volvo Ocean Race CEO Mark Turner and Chinese solo sailor Xu Jingkun will be the guests on tomorrow's Vendee Globe Live. Tune in at vendeeglobe.org/en/ at 1200 UTC. Rich Wilson (Great American IV): "We're going pretty fast here, but boats around us are going faster. I think the light winds part coming up through that high was just random – you couldn't really tell much from the grib files. They were 50 or 70 degrees off in terms of wind direction, but then weather forecasting is a really hard thing to do. I think that part was really frustrating but here we have the breeze now so it's about what you do with it, how strong are your nerves. One of the things I'm always amazed by, particularly by the sailors in the front of the pack, is how they can sustain these incredibly high average speeds. You've got to hold on all the time, and how you sustain that stress especially at night in the dark is just really hard. 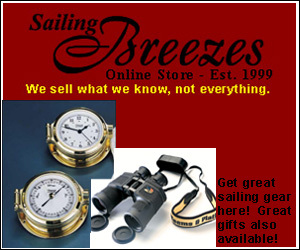 I have great admiration for sailors who are able to do that." 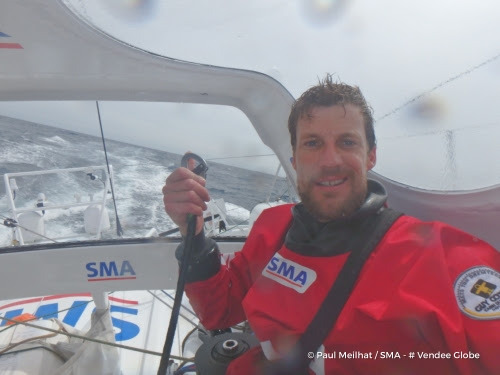 Paul Meilhat (SMA): "What a great surprise this morning, when I opened my bag of food. We're into December, the month of advent calendars. There was a surprise from family and friends waiting for me with number one on it. I can't wait to see what there is tomorrow morning. I've got a 25-knot NW'ly win and am continuing to surf along the front with Maître Coq at high speed. I finished the last of my fresh fruit today. After that it's going to be vitamin tablets. It's looking pretty complicated for the days ahead. We're going to have to avoid getting trapped by the low and not take too many risks." Alan Roura (La Fabrique): "We're on our way down towards the ice after a night worrying about the safety of the boat and how she was sailing. Should I head further north like Pieter and lose a lot of ground over the fleet, or take a few nice waves and get higher speeds moving south? I went for the second choice. I haven't taken all these risks heading south over the past few days to lose what I had gained. Although I calmed things down in terms of my sail plan, and therefore the boat's performance, the seas are still very heavy. I have thirty knots of wind and fairly cross seas, which is making it harder to surf than yesterday. I didn't want to take any risks gybing in 40-knot winds, so I hove to waiting for that to pass over. This is not a race against the clock, but a race around the world." Pieter Heerema (No Way Back): "It was a rough night and right now it's rough. I'm in the middle of a front so there's a lot that's happening. I'm getting a big squall coming over right now. I have winds of around 35-38 knots and it's changed direction so the waves are coming from all angles. It's very uneasy going, with all the banging, smashing and water coming over the deck. It's very humid outside but also inside the boat. It's not the kind of weather you'd prefer to see. 35 knots is too much – this boat is much faster and happier when the wind is 25 knots. We will have to pass this – there will be more over the coming few days – and then I hope in a few days we will be in a more stable wind environment. With these waves I just don't want to go full speed because there's still a long way to go and my goal is to arrive back in Les Sables with the boat and myself in one piece. Moving around the boat is difficult, eating is difficult, but we're managing…"